We went to the Westminster Dog Show and didn't get kicked out this time (2:27 - 8:04). Kyler Murray is playing Football (8:04 - 15:39). Hot Seat Cool Throne including bugs and Matthew Stafford some day being in the Hall of Fame (15:39 - 30:10). Dog Show Judge Rick Weyrich joins the show to talk about dog shows, what the perfect dog looks like, how Westminster works, and bonus he judges Leroy and Stella (30:10 - 65:05). TV Host and Superstar Howie Mandel joins the show to talk about his ... See More career and how disgusted he is with our germs/peeing into sinks (65:05 - 80:47). 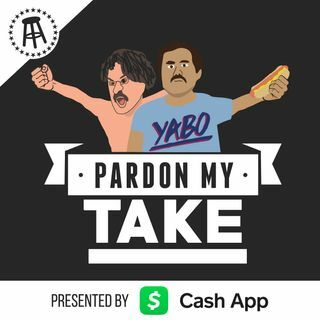 Segments include bachelor talk for guys that don't watch the Bachelor, stay woke, trouble in paradise Papa John is a Uk fan now, as a white guy esquire profiles a white kid, and guys on chicks.